Alison Hargreaves (February 17, 1963 – August 13, 1995) was an English (from Derbyshire) female mountain climber. She was educated in Derbyshire at Belper School. Her accomplishments included being the second person to scale Mount Everest solo without supplementary oxygen in 1995. She also soloed all the great north faces of the Alps in a single season—a first for any climber. 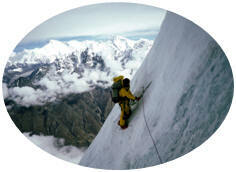 This feat included climbing the famously difficult north face of the Eiger in the Alps in 1993. Hargreaves also climbed Ama Dablam (6812m) in Nepal. After a brief return to the United Kingdom and her family, she left in June 1995 to join an American team which had gained a permit to climb K2, the world's second tallest mountain, located in Pakistan. K2 is regarded as a significantly more difficult and dangerous climb than Everest. By August 13, 1995, the remnants of the US team and Hargreaves had joined forces with a New Zealand and Canadian team at Camp 4, around 7600m above sea level, and at least 12 hours from the summit. Later that day, having joined with a Spanish team above Camp 4, New Zealander Peter Hillary (son of Everest pioneer Sir Edmund Hillary) decided to turn back, noting that the weather that had been fine for the previous four days appeared to be changing. At 6:45pm, in fine conditions, Hargreaves and Javier Olivar (Spain) reached the summit, followed by Rob Slater (US), Javier Escartín (Spain), Lorenzo Ortíz (Spain) and Bruce Grant (NZ). All, however, died in a violent storm while returning from the summit. Canadian Jeff Lakes, who had turned back below the summit earlier, managed to reach one of the lower camps, but died from the effects of exposure. Hargreaves's body was never found. The following year in 1996, her husband Jim Ballard accompanied by their two children made a pilgrimage to Pakistan to stand in the shadow of K2. Both of Alison’s children have developed an interest in climbing and Jim would like to make it his profession. Alison Hargreave’s Farewell to K2 was composed by PM Don Bradford of the Strathclyde Police Pipe Band. Originally from Aughnacloy, Co. Tyrone, Don Bradford has played with many top bands including Boghall & Bathgate, David Urquhart, 78th Fraser Highlanders, Strathclyde Police, Black Bottle and the Field Marshal Montgomery. 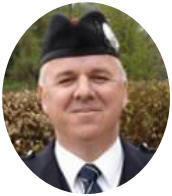 Don was recently appointed to the position of Pipe Major of Strathclyde Police.